DTD are European manufacturer of high quality lures and squid jigs. Having taken out the top squid lure award for the past two years at the prestigious EFFTEX tackle trade show, DTD have built a reputation for innovation and ingenuity, and their Trlja Trolling Squid jig is a fine example. The Trlja features a diving bib, which allows the lure to suspend and dive to the desired depth, like a minnow bait. The jig can then be slowly trolled from a boat or kayak so it swims horizontally through the strike zone (usually just above the weed line). Unlike a traditional squid jig, which you jig in and out of the strike zone, the Trlja remains within the zone the whole time. 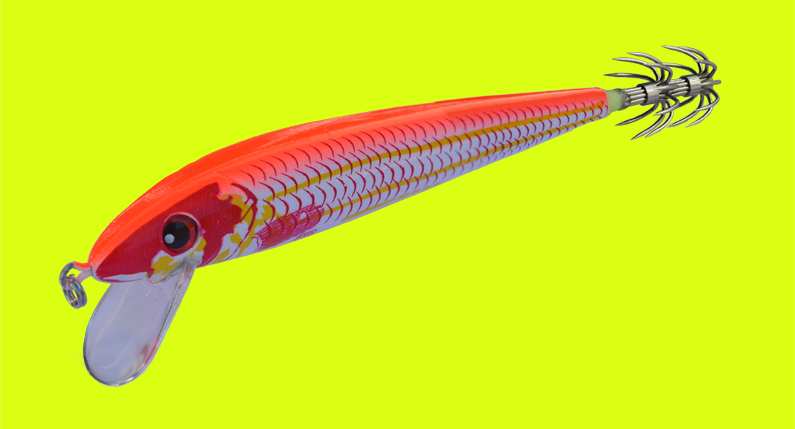 The realistic swimming action, coupled with the bright fluoro colour combinations (which directly imitate rock cod and red mullet) entice the squid out from the weed bed as the lure passes over their heads. Strong stainless steel hooks, durable cloth body, and luminescent glow effect all combine to attract the squid and to then ensure the catch is effectively landed every time. The Trlja Trolling Squid Jig is available in two styles (Trlja and Trlja Platno) and in two sizes (90mm and 110mm). Check out the video below to see underwater footage of this and other DTD jigs.